Last time British forces came to Tanga, the port city on the northern coast of German East Africa, they were thrown back into the sea after a humiliating defeat. But today, 16 months after that abortive fiasco, a force of five hundred Indian troops marches into Tanga virtually unopposed. General Jan Smuts, the South African who agreed to lead the effort to take Germany’s last overseas colony, now controls both ends of the Usambara railway after a 90-day campaign that began in the shadow of Mt. Kilimanjaro. 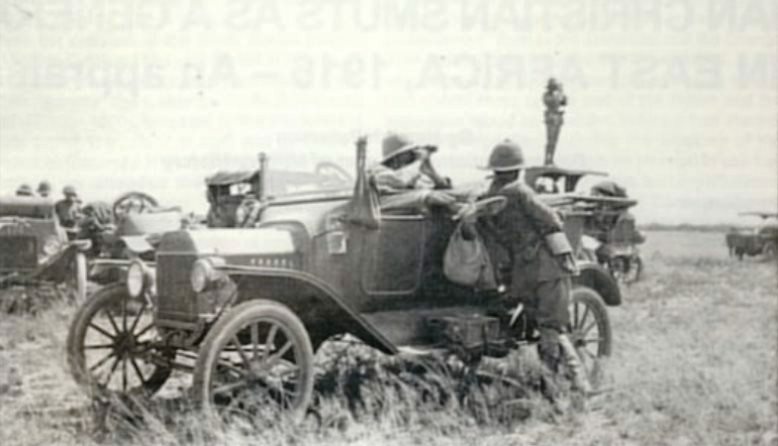 During that time, Smuts’s three columns have systematically cleared the enemy from the border zone all the way to the Pangani river using airplanes to reconnoiter, armored cars to patrol, and mobile wireless sets to communicate across such a vast territory. These will turn out to be very important innovations in such a huge country. Three times the land mass of the German Reich itself, German East Africa includes deserts, jungle, savannahs, and mountains, as well as distinct subclimates within each type of terrain. Confident of success at the outset, Smuts is finding the actual job to be much longer and harder than he expected. Not only is the future nation of Tanzania vast, but he must garrison areas behind him as he advances, so his own forces can easily outnumber the Germans 5-1 without ever being able to force a decisive battle on his terms. More to the point, now that Smuts controls one of the two main railroads, it isn’t built in the right direction for his invasion force as it moves south. Crossing the country from east to west, both of the German rail lines run perpendicular to his attack. 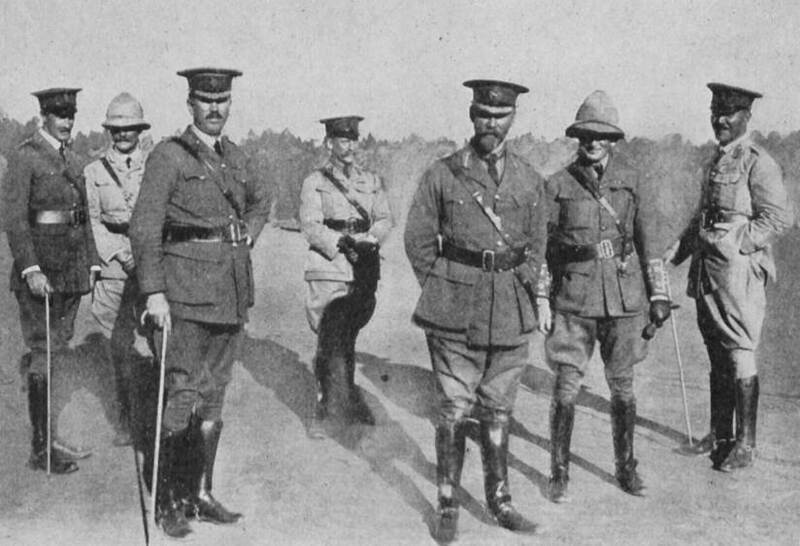 Unlike the successful invasion of German Southwest Africa (modern Namibia), where South African troops built and repaired hundreds of miles of rail line to facilitate a rapid campaign that closed out all resistance in a matter of months once it began in earnest, Smuts is finding the logistical challenges of his new assignment quite daunting, and his scratch imperial force still too small. His motor vehicles are tactically helpful, for instance, but they run on gasoline that must be delivered over greater and greater distances as he progresses, and there are no real roads to speak of, only traces and tracks through the bush. As seen in the invasion of German Kamerun, these human supply chains are supremely vulnerable to enemy action, with each side making a practice of targeting the other’s unarmed porters. Those taken prisoner have it worst of all, often starving or being worked to death or dying of disease in the hopeless conditions of camp. 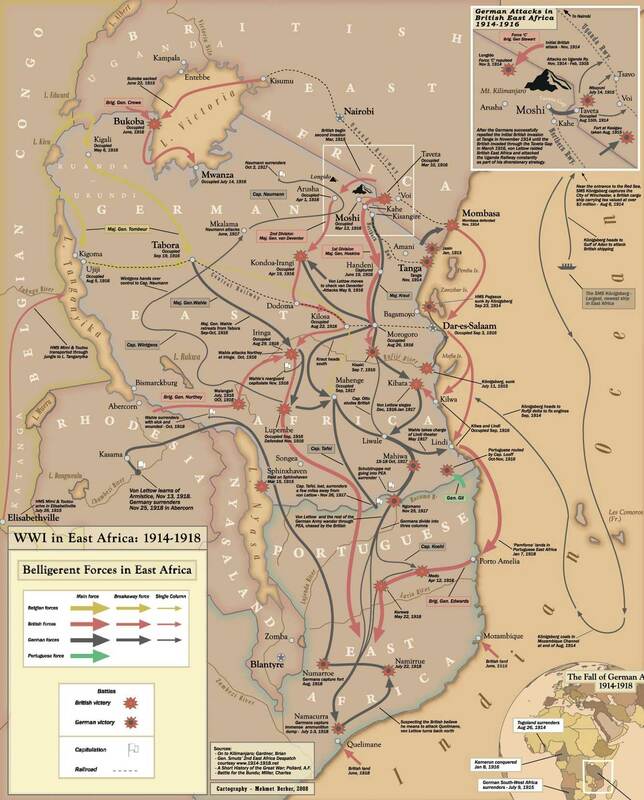 At first, the British Empire pays almost as well for carrying as for fighting, but administration is nonexistent, and many tens of thousands are simply worked to death; by the war’s end, with Smuts in London and a new commander grappling with Lettow-Vorbeck, the natives are simply drafted out of Kenya by force, en masse. Altogether, more than a million Africans will fight or carry for both sides, suffering very high death rates. Furthermore, the displaced human capital has severe consequences for local food systems. Stripped of their most productive males and ravaged by passing armies, particularly the Germans, villages in East Africa experience a severe drop in calorie production, and famine sets in. Jan Smuts will not be around to see the worst of it, but he will set it all in motion.